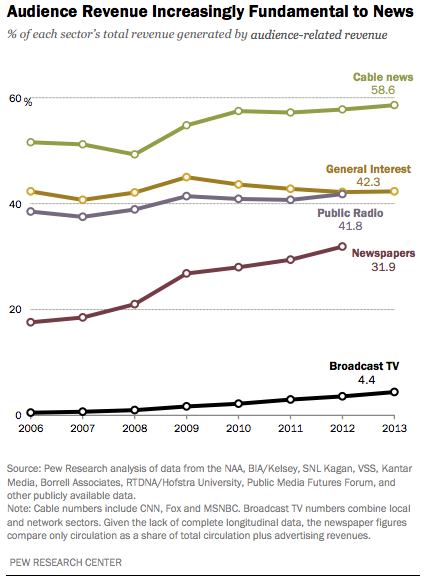 In its annual review of the media industry in the United States — which it published online early Wednesday morning — the Pew Research Center says the news business looks somewhat healthier than it has in past years, thanks in part to an influx of new investors and new jobs being offered by rapidly-growing digital-native entities like Vox and First Look Media. However, the report notes that traditional players still make up the bulk of the industry and that as a whole the industry continues to shrink rapidly, both in jobs and revenue. In the first-ever accounting of jobs created by new digital companies — a number based on surveys and public information — Pew said that about 5,000 full-time jobs had been created at nearly 500 digital news outlets. However, it also added that the “vast majority of bodies producing original reporting still lie within the newspaper industry,” and full-time employment in the industry fell by another 6.4 percent in 2012, with more losses expected in 2013. And what of paywalls? 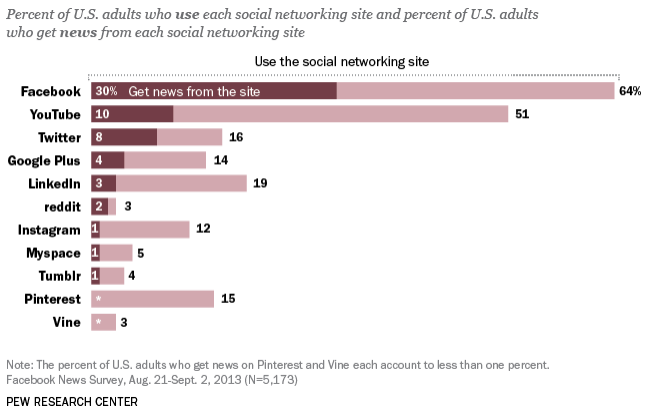 The Pew Center says that what it calls “audience-driven revenue” or subscriptions accounts for about 25 percent of the total financial support system for journalism, a number that has grown both in total dollars and as a percentage of the whole as more and more newspapers and other media outlets have set up paywalls and metered plans. But the report suggests this is not likely to save the industry from more pain. Once again ANOTHER article covering advertising and media that goes nowhere near the ROI issue! I would have been more interested in speculation about where we go from here with the obsolete paywall and display paradigm! But like much of the news, no one wants to deal directly in reality.